Color combined HST WFC3/IR F125W and F160W images of W2M J1042+1641 over two visits along with output from a morphological analysis with galfit (Peng et al. 2002). Credit: Glikman et al., 2018. Quasars are active galactic nuclei of very high luminosity, emitting electromagnetic radiation observable in radio, infrared, visible, ultraviolet and X-ray wavelengths. They are among the brightest and most distant objects in the known universe, and serve as fundamental tools for numerous studies in astrophysics as well as cosmology. Some quasars are obscured by dust as they transition from a heavily dust-enshrouded phase to typical, unobscured QSOs, which reddens their light. Finding quasars during such a transition could help astronomers better understand the processes of galaxy evolution and star formation. A group of astronomers led by Eilat Glikman of the Middlebury College in Middlebury, Vermont, has conducted a search for red quasars by analyzing the available data from the WISE and 2MASS (W2M) surveys. They were selecting objects based on their infrared colors, which resulted in identifying 40 red QSOs. Among the newly found objects was one quasar designated W2M J104222.11+164115.3 (W2M J1042+1641 for short). This QSO interested the researchers as it was more luminous than any other known radio-quiet quasar and implied extreme properties suggestive of gravitational lensing. "In this paper, we report the discovery of a quadruply lensed, radio-quiet red quasar discovered in a search for red quasars using WISE color selection and no radio criterion," the paper reads. In order to get more detailed information about W2M J1042+1641, Glikman's team also analyzed observational data of this quasar collected by Hubble Space Telescope (HST), Large Binocular Telescope (LBT), NASA Infrared Telescope Facility (IRTF) and Keck I telescope. W2M J1042+1641 was found at a redshift of 2.517. According to the paper, the quasar has an infrared luminosity of about 120 trillion solar luminosities and is moderately reddened from dust intrinsic to its environment. The researchers noted that W2M J1042+1641 exhibits outflows in its spectrum as well as morphological properties suggestive of it being in a merger-driven transitional phase. Moreover, the quasar showcases significant flux anomaly as its 20 cm flux density was found to be below 1.0 mJy. In concluding remarks, the researchers emphasized that the case of W2M J1042+1641 could be helpful for studies of less luminous, more typical infrared-selected quasar at high redshift. However, they noted that the origin of flux anomalies of this quasar is still uncertain, which should be a target for further investigation. "Microlensing magnification maps may be explored to investigate the possibility of the flux anomalies being due to microlensing. On a longer timescale, monitoring observations would separate microlensing and intrinsic flux variations. Since the quasar is radio-faint, observations probing narrow line emission from the source, too spatially extended to be affected by microlensing, would be required to separate the effects of microlensing and substructure," the astronomers wrote in the paper. We present the discovery of a gravitationally lensed dust-reddened QSO at z=2.517 discovered in a survey for red QSOs by infrared selection. Hubble Space Telescope imaging in the WFC3/IR F160W and F125W filters reveals a quadruply lensed system in a cusp configuration. We find that compared to the central image of the cusp, the nearby, brightest image is anomalous by a factor of ∼7−11. Although the source is extremely bright in the mid-infrared, a magnification by a factor of ∼50−120 places an upper limit of 1.35 mJy on the intrinsic mid-infrared brightness, well below the WISE W4 detection limit of 6 mJy. We find that this QSO is moderately reddened, with E(B−V)=0.7 and that ∼1% of the intrinsic spectrum is leaked back into the line of sight resulting in an upturn in its UV spectrum. We conclude that the QSO's reddening is intrinsic and not due to the lens. Consistent with previous red quasar samples, this source exhibits outflows in its spectrum as well as morphological properties suggestive of it being in a merger-driven transitional phase. Depending on how Lbol is computed, the quasar's accretion rate may be as high as 0.26 LEdd. We detect two Lyman limit systems, at z=2.102 and z=2.431, with absorption by metal lines likely at small impact parameter to the QSO, and a putative lens redshift of z=0.599. 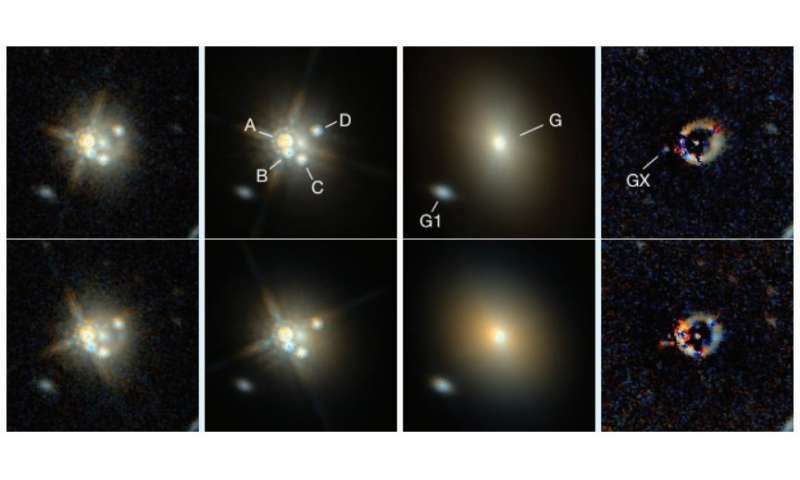 Given the rarity of quad lenses, the discovery of this source allows detailed study of a less luminous, more typical infrared-selected quasar at high redshift. As usual, you have everything confused. NOBODY suggested that dark matter is necessary for gravitational lensing, This is purely a faulty construction of your own making that results from your lack of understanding of the actual science. "We present the first detection of the correlated dark matter associated to a single cluster, PSZ2 G099.86+58.45." So, your post is doubly misinformed. Perhaps it is not memorable to you, but to astrophysicists it tells the source of the detection, the epoch of detection, and the object's celestial coordinates, making it a very useful moniker. Gravitational lensing is used to see what is behind a cluster of stars, gas, whatever else is in the region that prevents the reconnoitering of the region behind the one that is out in front. This is a useful process whether or not the alleged "Dark Matter" is present. Benni said: "Finally, someone has figured out that gravitational lensing does not require a dark matter halo encompassing the mass in question." Essentially, Benni is correct.that a Dark Matter halo is not required in the process of Gravitational Lensing of a star cluster.